New Free Printable Packet! 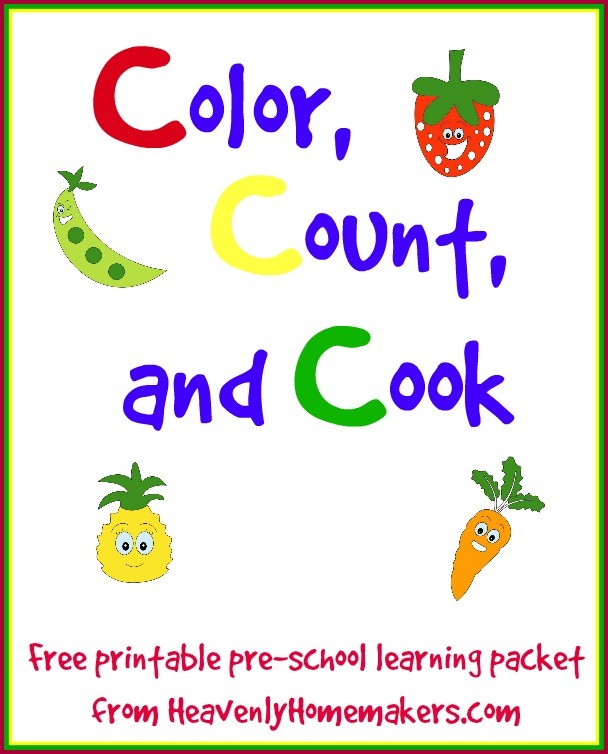 Color, Count, and Cook – for Early Learners! We’ve got a new free packet available for all of you who have young learners at your house! This one includes bright and fun learning activities to practice counting skills and color identification. Plus it offers some fun, healthy recipes you can make together with your kids! It’s fun and it’s free! Simply sign up here and watch for instructions in your inbox. Joining our Learning Zone will provide you will a huge page full of freebies beyond this one, by the way. Wait till you see! I’m excited to share that signing up for these freebies will connect you to our Heavenly Homemaker’s Learning Zone. It’s free, of course. You can unsubscribe at any time, your info will never be shared or sold, and being on this list means that you’ll be the first to know of the other fun (yes, FUN!) educational tools we’re putting together! P.S. If you are already subscribed to Heavenly Homemaker’s Learning Zone, you should have received an email yesterday giving you instant access to this freebie. Look in your inbox for the subject: FREE Color, Count, and Cook Learning Packet!